VISSCHER - Nova tabula geographica complectens borealiorem..
VISSCHER, N. / SCHENK,P. - Nova tabula geographica complectens borealiorem..
Nova tabula geographica complectens borealiorem.. - VISSCHER, N. / SCHENK,P. Map maker : VISSCHER, N. / SCHENK,P.. Size : 19.2 x 22.9 inches. / 48.7 x 58.2 cm. 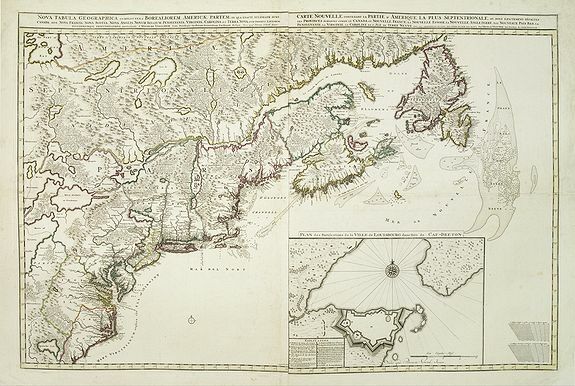 Description :A finely engraved pair of maps designed to be cut and joined together to provide a continuous coastline of North America from the Carolinas to Newfoundland and along the St.Lawrence and inland to Lakes Erie and Huron, and north to Hudson Bay. Covering such a large area, the scale of the map is inevitably rather small but, nevertheless, the detail shown is very great due to the fineness and precision of the engraving by L. van Anse. This is the third state (of 3) in very fine and delicate original colours. With inset map of Plan des fortifications de la Ville de Louisbourg dans l'Isle de Cap Breton. Condition : Two joined sheets. Some paper thinness on old folds, reinforced for protective reason. In good condition.